A travel and coffee trail: Counting stars and seeing places with ReachingDelphi. Each sunrise and sunset, each journey & every face along the way is a blessing; inspirations for today and a hope for tomorrow. 2018 turned out a little different than I had anticipated. First, I went from one cup of coffee to two and on some days even more. So that explains the additional coffee picture postings. 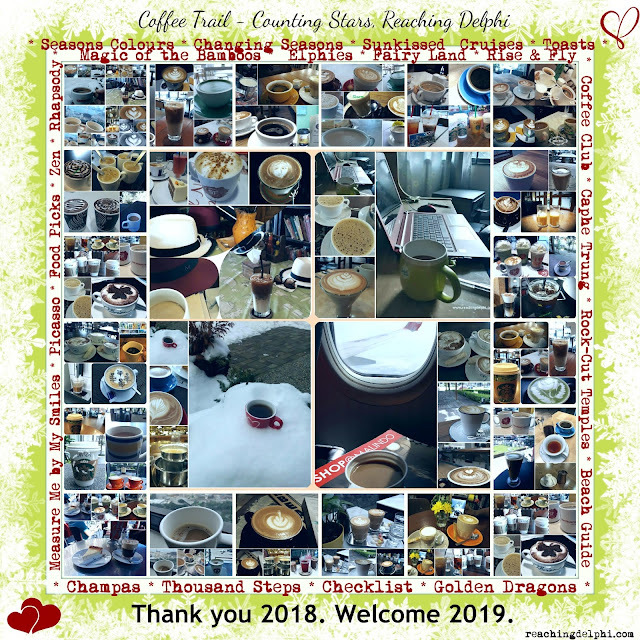 In 2018, we explored a couple new places, time-traveled extensively in our neighbouring country and went on virtual-walks with two friends to explore different seasons and colours. Each post in ReachingDelphi is unique and packed with lessons gained from the regions. Here is a recap of them and some coffee. I wish and pray that 2019 continues to bring us more positive-hours that will allow our effort to reach more distance, be it in any discipline. Life is an endless journey of learning and exploring. Let us be always curious to learn something new every single day. To kick off the new year, here is my first 2019 resolution - to set my cuppa to back to one. Japanese Cherry Blossom Trail, Part Two: Humbled Amongst the Flowers of Silence in Nagoya. From A Dreamer To A Picasso, The Walls Are Alive. Holi Malaysia 2019 - Colours Bringing Cultures Together. Zen in the Big City - Hong Kong Style! Cocktail of marbles, beaches and a golden dragon to the old pathways. Seasons Colours, An Autumn's Day Walk. Krabi: The Coffee Club Ladies’ weekend get-away! Checklists Czechia Germany Hong Kong India Japan Malaysia Singapore Thailand Vietnam Yummy Hungry! Gates lock at 3pm, Curfew is unchanged. © 2017 - 2019 reachingdelphi.com (Uma Singaram). All rights reserved. Simple theme. Powered by Blogger.